Pumpkin everything may be the hot foodie topic of the moment, but for serious gourmands and winos, it’s all about the year’s biggest culinary event. From October 15-18th, the eighth annual Food Network & Cooking Channel New York City Wine & Food Festival (NYCWFF) presented by Food & Wine will bring together sommeliers with wine aficionados and chefs with foodies for four days of libation and food appreciation. 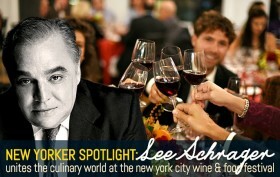 Lee Schrager, a vice president at Southern Wine & Spirits of America, is the founder, director, and visionary behind NYCWFF; he launched the event in 2008 following the success of its sister festival, the South Beach Wine & Food Festival. Fast forward seven years, and the NYC festival’s dinners, master classes, and wine tastings are some of the hottest tickets in town. We recently spoke with Lee to find out why he brought NYCWFF to New York, how he approaches each year’s programming, and what types of wining and dining New Yorkers can look forward to next week.